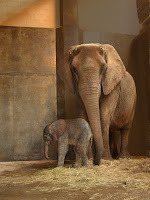 mmmaggie: baby elephant!!! plus: the circus! plus: bella training! baby elephant!!! plus: the circus! plus: bella training! bros. circus that's in town for the next couple weeks. we will get to see how they travel with the animals, and meet a few of the trainers that work with the tigers, llamas, dogs, and elephants. i'm so excited, i love learning about and seeing different kinds of training. **and an update on my bella training: my favorite little hog is doing awesome learning how to station. i ask her to go to her mat, and she has been doing it consistantly, so now i am making her pause on the mat before releasing her with the bridge (whistle) and giving her her reward. she held still for three seconds the other day while staring at me the whole time. yay, bella! once she is able to hold for an extended period of time, i will put the scale in there so eventually i can weigh her.